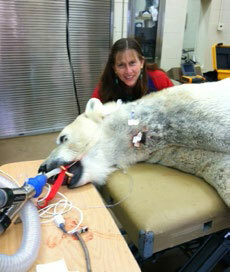 Dr. Beth Bicknese was in practice a couple years before changing to zoological medicine in 1988. Beth has worked at three different zoos and enjoys any kind of animal from poison dart frogs to elephants. She has been at the San Diego Zoo since 1996. Beth took the MAV course in 2015 hoping to offer alternate therapies to zoo animals, especially in pain management. When not at work, Beth is at home with her husband and three children, a dog, a cat, and some fish.